The Count de Hoernle Amphitheater is not a congenial environment for the performance of classical music. Amplification is required to make voices and instruments reach far enough into the space. However, it has a deleterious effect of the sound of those voices and instruments, falsifying their timbre while distorting it, upsetting ensemble balances and dynamic gradations. The result is the coarsening of the very thing the audience has assembled to hear. Added to it is a soup of unwanted sounds ranging from nearby rail and auto traffic, loud motorcycles, and the spillage of live music from adjacent watering holes. The opening of Pyotr Ilyich Tchaikovsky’s Overture-Fantasy Romeo and Juliet, which launched the March 3 program, begins with an Andante non tanto quasi moderato introduction featuring pairs of clarinets and bassoons. They were closely miked, which made the infirmity of their tone and intonation even more inescapably obvious than might otherwise have been the case. The harp was also comically overprominent in the electronic mix; its arpeggios sometimes sounded like projectiles hurled through the loudspeakers. So much for evocative instrumental color. Conductor Constantine Kitsopoulos took a broad tempo that was difficult for his orchestra to sustain successfully. Things improved with the arrival of the Allegro giusto main section. From there, the work progressed unexceptionably with the required emotional turbulence, mitigated only by the electronic degradation mentioned earlier. The strings summoned enough expressive power in the last statement of the famous love theme to generate a successful conclusion. Pianist Nikolay Khozyainov took the stage for Sergei Rachmaninoff’s Piano Concerto No. 3 in D minor, Op. 30. The 25-year old Russian displayed a warm tone and attractive lyric impulse, but he also was in complete command of the work’s legendary difficulty. He favored the composer’s original version, without the revisions made later to shorten and simplify some passages. The supplied Yamaha grand had a rather tinkly upper register and was also shy of bass sonority. It also began to lose its tune before the conclusion of the first movement. Khozyainov and Kitsopoulos delivered an account more efficient than eloquent, most notably in the first movement, which had some meaningless fluctuations of tempo. The linked second and third movements were more interesting, and the concluding Coda, as it always does, brought down the house. The piano having been moved offstage, the second half was occupied with Tchaikovsky’s Violin Concerto (in D, Op. 35). 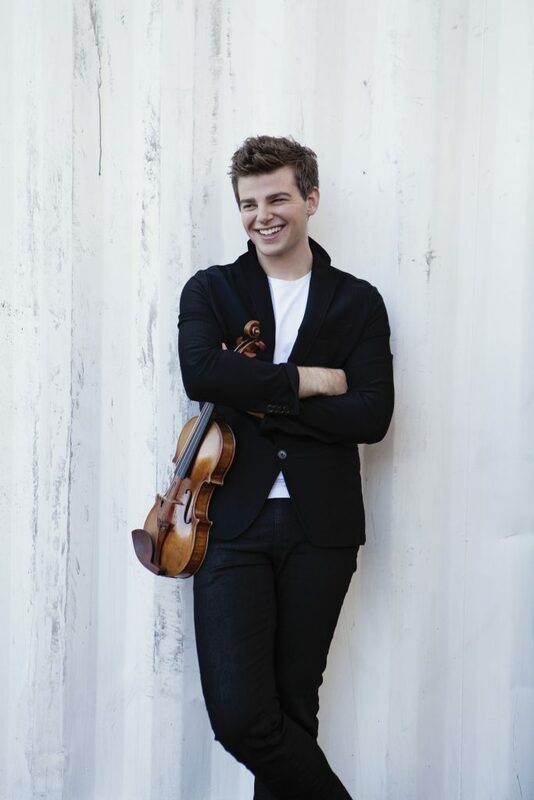 The soloist, Chad Hoopes, is a 23-year old American who was awarded an Avery Fisher Career Grant exactly one year ago. His instrument, the “ex-Stern” Samuel Zygmuntowicz of 1991, revealed a luscious sonority, putting the lie to the bromide that there are no outstanding new violins. That assessment is despite the distortion of it by the wretched spotlight miking that required skill and determination to listen past. He played an intensely communicative performance, heartfelt but also rather callow in its overeffusiveness. If he’s lucky, time will remedy that. For now, he displayed the right interpretative instincts, a good fiddle position, and was always fluent and technically immaculate. He chose to observe some of the traditional cuts initiated by Leopold Auer but not all. Near the end of the slow movement and the transition to the finale, his soft, delicate, intimate playing was rudely assaulted by a virtual bonanza of unwanted noises: an low-flying helicopter; train horns from the nearby FEC tracks,; aggressively loud motorcycles; and the sound of an emcee introducing an act nearby. Such distractions are seasoning experience for young performers but intensely distracting for the rest of us. The festival ought to find a more suitable place for the classical performers engaged next season. Otherwise, festival Director Joanna Marie Kaye should seek a local Croesus to bankroll a performing arts space worthy of the city of Boca Raton.